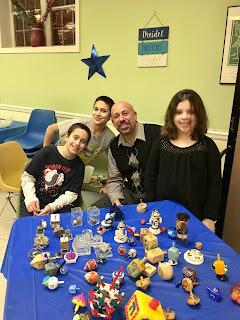 Our Hanukkah Party back on December 24th was a truly joyous celebration of the Festival of Lights, and dreidels! As we reach the end of 2016, I find I have mixed feelings about the Word of the Year chosen by Oxford Dictionaries: post-truth. Reflecting the Brexit vote in the UK as well as the presidential election campaign in the US, the term reflects the disillusionment that many of us feel with political discourse in the 21st century, especially as it is conducted via television, the internet, and social media. But the advent of post-truth leaves open the question, what is truth? In one sense, it is the opposite of a lie, and this year’s election campaign has seen more accusations of lying coming from both sides of the political spectrum than I can recall from past political seasons. A lie is a deliberate attempt to mislead, either by knowingly making a false statement, or by withholding information known to be true. Over the past half century, two of our presidents have gotten in trouble for lying—Richard Nixon, who was forced to resign, and Bill Clinton, who was impeached. Of course, some of us find that there is a significant difference between Nixon lying to cover up an attempt to undermine the democratic process, and Clinton lying to cover up a personal indiscretion. But both were guilty of failing to live up to the ideal of honesty. Jimmy Carter, on the other hand, campaigned on the promise that “I’ll never lie to you.” Whatever else might be said of him, he tried to tell the American people the truth about the end of postwar prosperity. His message was not well received, to say the least. The apocryphal story of young George Washington admitting to chopping down a cherry tree with the words “I cannot tell a lie” reflects one type of honesty, honesty in confession of sin, wrongdoing, or error. This kind of honesty is very much a part of Jewish religious and ethical tradition, and the Judeo-Christian foundation of the American republic. It is a practice that our president-elect seems to avoid more often than not, although it has been in general decline through our culture, in part due to the litigious nature of our society, but also due to a decay in people’s willingness to take responsibility for their actions. Abraham Lincoln was known as “Honest Abe,” reportedly long before he entered the political arena, when he was a young store clerk and, notably, when he was a lawyer. In this regard, beyond telling the truth, honesty refers more broadly to integrity and trustworthiness; beyond lying, dishonesty includes a variety of unethical behaviors, such as cheating. Here too, we can trace this ideal back to biblical passages such as can be found in the Holiness Code (Leviticus 17-27), which includes the commandment “You shall not cheat in measuring length, weight, or quantity. You shall have honest balances, honest weights…” (18:35-36). Accusations of cheating also have been a part of 2016 politics, again directed at both major parties and their candidates. Admittedly, these concepts of honesty are old-fashioned and obsolescent in our contemporary culture of celebrity, where honestly amounts to self-display and self- promotion. It is the honesty of going on a talk show and talking about yourself, or feeding details of your personal life to the gossip outlets. Donald Trump is seen as honest by his followers not because he accurately conveys the truth, but because he says what he thinks, seemingly with little or no filtering. This stands in stark contrast with the typical politician, who sends different messages to different audiences, especially to wealthy backers as opposed to the general public. Not to mention the fact that officeholders often must withhold information from their constituents. Because Trump seems to say whatever comes into his head and does not care to be diplomatic in his remarks or hold back in concern over anyone’s sensitivities, he is seen as honest in a way that renders any inconsistencies in what he says irrelevant. So what if he contradicts himself from one situation to another, if what he says at any given moment is what he truly is thinking, what he truly believes to be true? In this way, Trump’s vulgar remarks caught on tape before an Access Hollywood appearance serves as more proof of his honesty, and does not conflict with his statements that he loves women and that no one has more respect for women than he does, at least as far as his fans are concerned. The kind of honesty Trump represents is associated with the ideal of authenticity. For celebrity logic, authenticity means playing yourself, even if you are playing a role. That’s the difference between being an actor, along the lines of Meryl Streep or Dustin Hoffman, or being a star, like Arnold Schwarzenegger, Sylvester Stallone, or Adam Sandler for that matter. What fans often forget is that playing yourself is still playing a role, that authenticity on the part of celebrities is still an act. Politicians can accuse their opponents of lying as a way of emphasizing their own image of authenticity, but actually proving such claims can be very difficult, because they require some evidence that there was an intent to mislead. The Watergate conspirators avoided charges of perjury by using the phrase “to the best of my recollection” in conjunction with their testimony. Who can prove that a lie is not the result of a faulty memory rather than a deliberate deception? For similar reasons, journalists rarely accuse anyone of lying, instead identifying statements as false. That leaves open the question of whether the politicians were simply mistaken, or in the neologism used by press secretaries, whether they misspoke. Journalists can, however, report on the accusations of lying made by some other source. While they may not be able to support the claim that candidate A is lying, they can easily show that candidate B said that candidate A is lying. The important point is that while in one sense lies are the opposite of truth, in another sense it is falsity that is truth’s antonym. The contrast between true and false takes us away from the ideal of honesty, and removes the factor of personal belief. Instead, we are asked to objectively consider the logic of the claim, and the evidence that may support or refute it. This meaning of truth is closely related to the concept of facticity, hence the Oxford Dictionary definition of post-truth: “relating to or denoting circumstances in which objective facts are less influential in shaping public opinion than appeals to emotion and personal belief.” This reflects the commonly held view that facts are statements that are true, typically having been verified scientifically. But this is based on a misunderstanding of science. A scientific fact is a statement that is open to testing. A statement such as “God created the world,” cannot be tested empirically by any known method, and therefore cannot be considered a scientific fact. That means that it cannot be tested to see if it’s true or false. A statement such as “The world is approximately 6,000 years old” can be tested via scientific method, and has been shown to be false. But it is still a fact, in the sense of being a statement open to testing. Ronald Reagan was notorious for citing facts that turned out to be false, but no one accused the former actor of lying. Actually, according to philosopher Karl Popper, scientists can never prove anything to be absolutely true, because to do so would require observing every possible instance of the phenomenon in question, past, present, and future. And it only takes one exception to prove the theory false. In this sense, science advances by falsification alone, by eliminating error and mistaken notions. Science cannot give us truth, just tentative explanations that conform to the available evidence, and effective means of predicting outcomes. Science is by far the best method we have for making such predictions. But absent claims of absolute truth, science leaves open the door to relativism, a view that is problematic when it is championed by the left in regard to morality, and by the right in regard to reality. Stephen Colbert introduced the term truthiness to refer to George W. Bush’s reliance on intuition and gut feelings as a guide to truth, rather than logic, evidence, or even thoughtful reflection. The word seems almost quaint now, as it retains at least a bit of a folksy connection to some sense of the truth, something less extreme than post-truth. It is perhaps a reflection of nostalgic longing and disturbance over contemporary public discourse that accounts for the revival earlier this year of the classic television game show To Tell the Truth, introduced in 1956 by Bob Stewart, née Isidore Steinberg of Brooklyn. But truth long has been a problematic term, and for many years now we have been rightfully suspicious of anyone who lays claim to the truth. The true tragedy we are witnessing is the decline of rationality. The prophet Isaiah declared, “Come now and let us reason together” (1:18), and it was the Enlightenment, the Age of Reason, that gave birth to the American republic. The democratic basis of our government was predicated on our ability to engage in rational discussion and argumentation, and through competition in the marketplace of ideas, arrive at the truth, or at least negotiate a compromise between opposing opinions. Rationality has been under attack on two fronts, from the irrationality of an image culture that emphasizes appearance and personality rather than sensible language, and from the hyper-rationality of number-crunching information technologies that leave no room for deliberation or value other than efficiency and productivity. We are caught between emotional appeals that leave no room for thoughtful, impartial consideration, and calculations of quantifiable certainties that do not allow for human evaluation and judgment. In short, reason is being squeezed out by the extremes of big data and big dada. The end of rationality has had an adverse affect on the State of Israel as well, as Jewish culture, with its long tradition of Talmudic scholarship, which emphasizes reasoned discussion. Israel’s attempts to use logic and evidence fare poorly in the face of its enemies’ use of images and emotional appeals in the international arena. Liberals have had more difficulty adjusting to a post-rational world than conservatives, given the liberal bias toward intellectualism. One advantage that liberals do enjoy is in the use of humor, so look for comedians to take on leadership positions in the Democratic Party. For this reason, I wouldn’t be surprised if Saturday Night Live alumnus Al Franken, the junior United States senator from Minnesota, was the Democratic nominee in 2020. But the end of reason is not a problem only for liberals. It is a challenge to liberalism writ large, to our ideals of freedom and equality. And it makes it all but impossible to follow the commandment found in Deuteronomy (16:20): “Justice, justice, you shall pursue.” How can we pursue justice in a post-truth, post-rational world? A long time ago, in a galaxy far, far, away (well, actually, back in the 1970s over in Forest Hills, New York), during a Confirmation class at Temple Isaiah (which no longer exists, having merged with five other synagogues decades ago), one of my classmates referred to our temple as Reformed, and our rabbi was quick and quite insistent in responding: It's Reform, not Reformed, we didn't do anything wrong! This stuck with me all of these years, and it seems only appropriate to bring it up here and now, given that Rabbi Schwartz has devoted this year's Saturday morning Torah Study sessions to the topic of the Reform movement, not to mention the fact that the officers and trustees have recently sent a letter to Israeli Prime Minister Binyamin Netanyahu protesting the treatment of Reform and Conservative Jews wishing to engage in egalitarian prayer at the Western Wall, in an area that the Knesset decided would be set aside for such worship. As Reform Jews, we are reformers, active participants in an ongoing process of reformation. What we stress is the need for individual reflection and choice regarding our form of worship. Each one of us must decide for ourselves what aspects of our religion are meaningful to us. We are asked to make our own decisions regarding what rituals and practices are significant to us, what traditions we wish to embrace, what we do and do not believe in. Of course, we must make informed decisions, which is why we value education so highly, for our children and adults alike. As reformers, we are not asked to discard all of our 4,000-year-old history and religious traditions, and we are not tasked with creating our religious experience by starting from scratch. Rather, we are taught to view Judaism as a living tradition, one that continues to evolve and grow, and does so through our own efforts. As reformers, we are not passive subjects who have been reformed by some outside agency. We are active participants, asking questions, engaging in discussion and debate, we are seekers, learners, doers. Ours is a spiritual quest that takes us beyond rote memorization or rituals that no longer convey a sense of the sacred. Our goal is true communion, together, as a caring community. As reformers, we are inspired by the Torah's call for justice, the ways in which it teaches us to see the face of God in every living being, and directs us to pursue tikkun olam, the healing of the world. We refer to the Reform movement as a branch of Judaism, acknowledging that we do not represent a schism or separate sect, bur rather one of several legitimate ways to approach living our lives Jewishly. Affirming the unity of the Jewish people, we are reformers, but we do not seek to reform others, we do not claim that ours is the only way to practice Judaism, we do not deny to our Orthodox, Conservative, or Reconstructionist co-religionists the right to practice Judaism in whatever way they find meaningful. We are reformers only in insisting that each branch has defined our religion in new ways, that no branch lays claim to a more authentic or correct form of religion, that no branch practices Judaism in the way that Abraham, or Moses, or Hillel did long ago. We are reformers in our belief that Judaism has a long history of reformation, and innovation. We are a religion of progress, and Reform Judaism is Progressive Judaism. 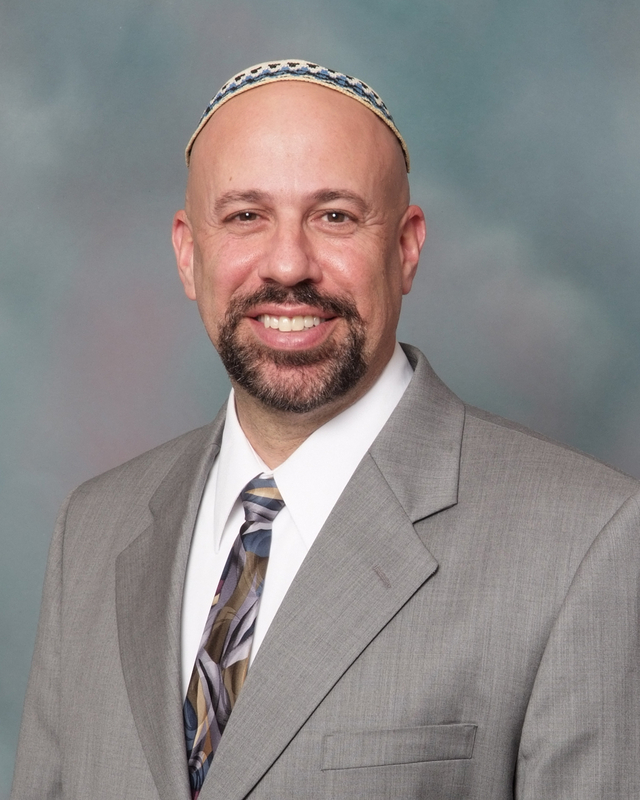 Adas Emuno is a Reform shul, not because we are less Jewish than the other branches, and not because we represent some form of light or lightweight Judaism, but because we are an assembly of faithful reformers. We are active participants in our religion, not in adhering to all of its traditions, but in working out how to be Jewish in the 21st century, and what it means to be Jewish today. That is our mission. We invite all who share in our outlook to join us on this ongoing journey. And we ask all who are willing and able to support us in any way that you can. We tried something new this past holiday season. We held a Mitzvah Mall with two goals in mind: the first and foremost was to "bring to life" the concept of tikkun olam (healing the world), which our students learn about in our religious school and at home, by presenting special people in their lives with special gifts. The other goal was to raise money for some charitable organizations. Well, our students, their parents and other congregants opened up their hearts (once again!) so we raised $500 in donations! Here are the subtotals: Center for Food Action—$109; Leket Israel—$66; Joseph M. Sanzari Children's Hospital at Hackensack University Medical Center—$146; Jewish National Fund—$72; UN High Commissioner for Refugees—$107. But wait! There's more! 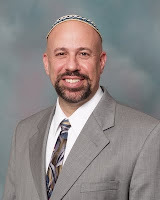 Rabbi Schwartz offered to match all of the donations! So our grand total was $1000 in donations to these wonderful organizations. So thank you very much to everyone who supported this event. Thank you, too, to the following people who worked it: Jody, Pearl, Ron, Richard, Carol, Virginia and Lauren. Lauren also designed the cards and then worked with Instant Image Printing of Ridgefield for the final, beautiful results. And thank you to Amy Chartoff, Virginia and Rabbi for the table materials. It's Super Bowl LI (51) vs. AE Souper Bowl II. From the beginning of January, through Super Bowl Sunday, February 5, we will be collecting soup of every sort, including though not limited to cans, cartons, packaged and microwavable containers. Please bring donations to the vestry room at the entrance to the sanctuary. Last year we collected a little over 100 items… maybe this year we can beat our own score? Not Social Action, but “social”! Thanks to Debby Schwartz for the fun challah baking workshop on December 13! It’s well established science that reading boosts vocabulary, sharpens reason and expands intellectual horizons. But the latest round of research on the benefits of literature focuses on how it improves not our IQ, but our EQ. The essay goes on to introduce us to “bibliotherapy”–the prescription of books, especially novels, to improve our mental health. A bibliotherapist in London is quoted as saying that, “the right book at the right time of your life can open a door and help you to see something in a new way, or just give you that next leap into new maturity.” Her colleague adds, “inhabiting a novel can be transformative in a way that using a self-help book isn’t.” Clients fill out a long questionnaire about what they like to read and what is going on in their personal lives. After discussion, the bibliotherapist sends them a list of six to eight novels designed to address the challenges in their lives and the reasons for their recommendations. The London practice claims a 99% positive feedback rate. 1. As a Driven Leaf (Milton Steinberg)–for a crisis of faith. 2. Goodbye Columbus (Phillip Roth)–for emotional insecurity. 3. Exodus (Leon Uris)–for apathy to Israel. 4. The Chosen (Chaim Potok)–for father-son issues. 5. The Assistant (Bernard Malamud)–for those in need of empathy. 6. The Slave (Isaac Bashevis Singer)–for overcoming self-pity. I have many other books for many other situations. Just give me a call or send me an email. Unlike the London therapists who charge £100 ($125) an hour, my service is free. My only reward is your reading pleasure! 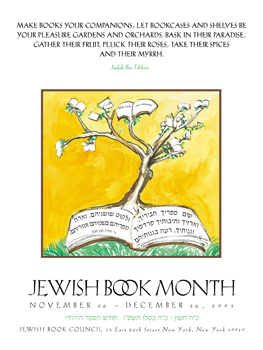 In the words of the medieval sage Judah Ibn Tibbon, quoted in the Jewish Book Month poster below, “Make books your companions”.